Did you know that we include recycling methods for our hazardous materials processes as much as possible? 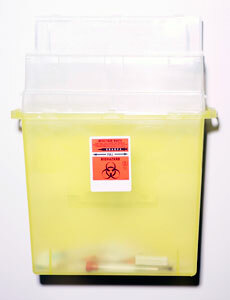 The sharps containers used at the hospital are re-usable. The contents are sent for incineration (purple top containers) or steam treatment (red and white containers), while the container is cleaned and sent back to UCLA. Batteries and fluorescent tubes are sent to recycling facilities to reclaim as much of the materials as possible for re-use and recycling. For household hazardous waste, please refer to: the UCLA S.A.F.E. Center for proper disposal options. For other S.A.F.E. Collection Centers within the city and county of Los Angeles, click here.